darkSpyro - Spyro and Skylanders Forum - Skylanders: Trap Team - Who kills fastest? darkSpyro - Spyro and Skylanders Forum > Skylanders: Trap Team > Who kills fastest? I've pretty much got all 4 stars on every level, with the exception of the speed ones for Wolfgang, the Kaos battle and Midnight Museum (not very good at pinball as it turns out. Struggling to get the ball in the 'dohicky'). I can't have a red hot crack at any of these yet because my tennis elbow is still way too sore, but when I can should I be using Kaos or Trapmasters, or Eon's Elite characters to take down these bad guys quickly? Who have you found to do the most damage in the shortest space of time? The Kaos battle in particular is an interesting one as you need to be able to attack whilst dodging the never ending wave attacks. Should be Drobot, but I think Lob-Star is just fine, in his steamed form. Bumble Blast, Chopper and Pop Thorn are also great choices, in my opinion. Midnight Museum was one of the last ones I had to 4 star (Hard mode)...the three ball room was a TOTAL pain. I'm assuming you mean Nightmare mode. I'm up through chapter five now. 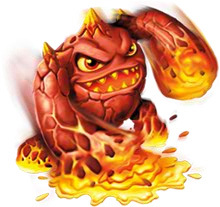 It was hilarious dying to 5 skylanders tonight on such an early level in nightmare....but as everyone knows the bull rush technique need not apply in this mode. It's nice to know there are others who feel my pain of that Portal Master forsaken museum of darkness! Um... Anyway, Wallop on his Tantrum Mode path deals insane damage. Maybe try him? Funny thing about that three ball part. When I had my first playthrough and just trying collect things that three ball part was a single strike for the three balls. But revisiting I haven't been so lucky. For a speed run - I'd focus on Lob-Star, he's got the movement with his dash, he's got the projectiles and fires at a speed good enough to keep up with the best damage dealers, while not locking him down with long animations - so you can avoid Kaos blast and the such. Yeah in Nightmare mode. It seems harder on some chapters, but I mostly didn't notice much difference. But the Kaos battle certainly seems much, much harder on Nightmare mode. That's interesting, weren't people on here saying how disappointing Lob-Star was? He looks good from what I've seen on Youtube, but I thought he was under powered from what people have been saying. They were mostly personal opinions. He's one of the fastest and strongest Trap Masters. He's just tricky to use, sometimes, because his boiling moves, when his Soul Gem is purchased, requires you to stay in place for some seconds, but if you learn to use it, he becomes a beast. Almost defeated Kaos on Medium using him, but got killed near the end of the fight, because my Lob-Star is't maxed out yet. Yeah, folks who said he sucked were just flat out wrong. Think of it this way Once boiled he throws around 4 stars a second. At least ONE of them lands a critical hit. It's been a while, but I believe each one hits for like 54 with the crit being like 80 or 90. So per second - you're talking more than 200 dps at range, with the ability to move as necessary. His dash is honestly a top 3 movement power - between the distance, the speed, and the lack of recharge, few cover as much ground as fast as he can. His boil is TERRIFIC against non-boss characters, depending on path (go steam, go steam go! ), as the knockback will keep you safe against 75% of attackers, while charging up, and the bonus you get from it is ridiculous. I'm not sure how I feel about his wow-pow - the attack itself is DEVESTATING, but the timing needed to make it work AND to NOT do it when fighting say Kaos, admittedly takes practice. But yeah - I've got all the releeased TMs at this point, and from a purely tiering stand point - not "I like his design", but "I'm trying to beat something" view point? Wildfire loses out to Lob-Star from being most effective at melee range. His movement is actually pretty fast, just triple tap his main attack, pause, and retap, and you'll see yourself flying all over the place - essentially wave dashing after the shield spin. He does IMO the most dps of any TM, just his basic attack chain does high damage, and the shield 'slide' variant - so far is the highest damaging combo that I've seen (or can remember). Wallop and Gusto are honorable mention, but both are slow. Good for boss battles, not for levels (time). Agreed on Ka boom. It took me a while to warm up to him but I'm definitely coming around. Wildfire deals some serious damage...the vulerability of waiting to get in boiled mode with Lob star is why I'm still lukewarm on him. As for boiling, did you go the steam path? He pushes away bad guys and keeps himself safe. Also, I usually do it right 'before' a fight starts, he holds it for a VERY long time once upgraded. Even though I didn't go with the steam path, he's still a monster. Can't imagine how powerful he would be, with that knockback to keep him safe while he boils, and the extended boil time, but I'm happy with my choice. Gearshift is really, really good too. I like her on the Dual Mode path which boosts her melee and, perhaps more importantly, her spinning gears she tosses out. Those spinning gears are really nice. You can have 3 out at once and once they are out, you can be doing anything you need to do while they deal great damage over time on their own. Really good for bosses with dodging laser phases where you need to find tiny windows to deal damage. She also has a simple, great dash/movement ability, and even when specced for Dual Mode, you can always switch into ranged mode if need be. Very versatile, powerful, fast. I think she's the best character from Trap Team so far (just my opinion). Edit: This doesn't exactly fit with the topic as far as who has the highest DPS. Gearshift probably doesn't have the highest DPS, but she is my personal number one for who I take into difficult NM mode stuff. Nice dash, very versatile (with melee, ranged, and amazing gear "pets" if specced Dual Mode), and definitely adequate damage for any speed run. I love Gearshift as well. I typically use her ranged attack. ok well everyone has there own strats for doing speedruns it all really depends on who you play best with. for me im best with knightmare and tae kwon crow. knightmare is fast and i have learned to play her very well and rarely even get hit, for quick kills i swap to tae kwon crow as his 3 attack combo is lighting fast and hits very hard ( 350 each hit) i kill bosses with him very easily. im going through the game on nightmare mode to 4 star it all. first level i did was the last one, and i had to go kaos vs kaos to do it. His main attack ( if RNG loves you) refreshes his timer so its almost like infinite health, so you can eat all the waves and just blast him with his " awesome head" laser attack. fight still took about 17 mins but the speedrun time is 29 mins. also, i remember struggling on some of these levels first nightmare play through but now im not even trying and beating it all. I find Terrafin, on his punching path, to be good for speed runs, but I only do Easy and Medium, so it might be different on other modes. Here's an item. Why not use damage-inducing Magic Items like Sparx the Dragonfly, Anvil Rain, Rocket Ram, Tiki Speaky, Hand of Fate, Dragonfire Cannon, and the Arkeyan Crossbow on Wolfgang in Nightmare mode? Also, I'd use the Time Twist Hourglass to slow down time long enough to get under 11 minutes of gameplay in The Future of Skylands. I did the same against Kaos in Nightmare mode to achieve "Don't Switch" and "No Lives Lost". If only my wish was granted and there was an Eon's Elite Drobot, he would be my vote for fasting killing terminator Skylander. I love how he says "Drobot, elite robot" after certain rounds of Kaos' Challenge. Tuff Luck and Knight Mare are both extremely powerful. They're easily the two best Trap Masters. They can really give Wolfgang a major beatdown if you can get shots in. Tae Kwon Crow and regular Kaos both whoop major behind, due to their incredible damage output. Yes I've been thinking about using some of these on Wolfgang. I have a few Time Twist Hourglasses. But right now I can't get time on Midnight Museum. Should be easy enough, except some dimwitted moron at TFB thought that it would be funny to put stupid big glowing balls into a stupid, uncontrollable pinball game. I have just done it for the 4th time, with my elbow in agony, only to have that ridiculous thing chew up 3 minutes plus on each run. Anyone who gets them in, in under 3 minutes has fluked it, I am convinced that there is 0% skill and 100% luck in this ridiculous addition to the game. TFB game developers must treasure their anonymity. Still the fact is I live in Australia and I may have calmed down by the time I got to America anyway. OVER 4 MINUTES PLAYING PINBALL!!!! Ahhhhhhhhhhhhhhhhhhhh!!!!!!!!!!!!!!!!!!!!!!!!!!!!!!!!!!!!!!!!!!!!!!!!!!!!!!! Second last go fell short by 28 seconds of getting the time tick after playing pinball for just under 3 minutes. Giving up, arm is too sore. Although given how sore it is I won't get any sleep tonight anyway. I HATE YOU TFB. First time I failed I did so by only 3 seconds. And I blame those DANG PINBALLS! Eon's Elite Spyro or Trigger Happy with Frostfest hat! They are quick and really pack a punch. I also have a hard time with the three pinballs in Midnight Museum. I find if you have 2 players its much easier. Ah The Who, I'd forgotten all about that song. That's brought a smile to my face. Maybe I need to close my eyes and play be instinct. Couldn't do worse. Surely there should be some inbuilt mercy rule that forces the balls in the hole after 2 minutes. And falling short by 3 seconds? My head would explode in a fit of rage. Midnight Museum & Sunscraper Time Challenge, eh? One comes to mind when I did those...... & used Kaos on the bosses. I actually easily got through Sunscraper first go and I would comfortably get through Midnight Museum too using my elite stealth elf, if only I could get past those stupid pinballs. I think , and I've seen on YouTube. He looks pretty strong. Speaking of which, there's still speed runs I can't finish in Swap Force...I'm literally dumbfounded. I got so sick of Swap Force and the Not Taking Any Damage challenge that I haven't 100% that game yet. But can't seem to get motivated to try again. Chapters are so long and it takes so long to try again if you do get hit. From memory I haven't done all the time or point score challenges on it either. One day I will probably go back to it. That requirement was on the boss battle chapters only, and I'm right there with you. Ok so finally, after another 7 attempts - making that probably more than 20 times that I've done that chapter - I've completed the Midnight Museum time challenge. Finally those stupid balls fell into those stupid holes in under two and a half minutes. Normally I would expect for feel happy but instead I just feel annoyed and glad that I never have to do that chapter again. So I decided to have a wander through the final Kaos battle to get some ideas for how to complete its time challenge tomorrow night and what should happen? I completed that time challenge with over a minute to spare not really even trying! All that's left now, apart from the Mirror of Mystery which hasn't been released in Australia yet, is getting Wolfgang's done in under 12:40. I've already tried and failed at that one a few times but it's tough and might need to wait until my elbow is better. Thanks for all your suggestions. We have some of the trap masters mentioned so I will give them a go in the battle against Wolfgang. You can change the difficulty to easy to finish them and still get the check for nightmare mode as long as you've at least once completed that level once in nightmare mode. For certain levels even on easy, I barely made the time limit and I'm fully convinced that you can't meet the time limit requirements for speed runs in all levels if you do them in nightmare mode. Same thing as the speed run...as long as you have completed the boss challenge once in nightmare mode, you can do the no damage challenge on easy mode and get the completion checkmark...although you still have to avoid all attacks, it's much easier to take down the enemies. I had to try many times for both Kaos and Mesmerelda...Spy Rise is an absolute savior since he can rise above to avoid attacks. I totally agree with you, Matteomax. If you really want to get through a level quickly, I recommend using Roller Brawl (on the Shadow Skater path) and Tae Kwon Crow. Roller Brawl's bullrush boosts her speed majorly, and Tae Kwon Crow can defeat enemies extremely fast. This is how I got through Operation: Troll Rocket Steal so quickly (Under 4:30, from what I remember.). i was playing last night and seeing all the pain about midnight museum pinball i decided to give that a try. i got to the 3 pinball part and got all 3 balls in the hole in like 20 seconds. i was surprised and i beat the time trial first try. me and my blind luck on the pinballs. last major hurtle from the looks of it will be wolfgang. theres no way to speed up that laser light show part is there? Ok this is the team that I will use tonight on Wolfgang. One of the challenges I find on this level is shooting those robots that have the force fields. Trying to get behind them to do damage slows me down at times. Congrats on the fast pinball. I'm sure I got through it quick on the times that I was taking my time finding everything. The laser light show is a pain. So is the atom splitting thing that takes about a minute. In reality you only have 11:40 if you take out that minute. Then there is the flying/shooting power cables. This could take a LOT of goes in addition to the failed attempts I've already made. I'm not sure how to pull it off, but once I had a glitch where I exited one level by selecting another, and it went to the level completion screen and gave me an extra star. If someone figures out how to pull it off consistently, that glitch could probably be used for the time goal. I freakin' hate pinball, so I don't even want to attempt MM without this glitch. It might be the first thing in these games that I leave uncompleted. I'm glad I'm not the only one who hates it. Done, completed, 4 stars on every level with the exception of the Mirror of Mystery expansion pack which hasn't been released in Australia yet as far as I know. Elite Stealth Elf did the job on Wolfgang with 4 seconds to spare. Completing that one was rewarding, not like Nightmare Museum which was just annoying. Now to wait for MoM and Skylanders 5. The pinball one is very annoying for me as well. The first time I played it, the balls went right in like magic and I scoffed at how pointless that room was. Then when I went for the time challenge and it took 5 resets to get a fast enough pinball time. Once I missed it by a mere nine seconds! I don't know what I'll do to get this done on nightmare mode when the baddies are much harder to kill. There doesn't seem to be any technique to it either, I mean I can get them into the right areas with no trouble, but it's just so random if the balls will roll into the holes or not. The person who made this part of the game should be kicked in the pinballs repeatedly. There has to be a quicker cheat that we have not thought of using to get this done...just a thought, can Magna Charge or perhaps a Giant pick up the ball and put them into the slots? Some lame villain power that we don't really know the full powers of like lobbing a few bombs into the holes? Or perhaps Mastermind can use his powers to pop open the door like with those silly puzzles? There has to be something as this is just too challenging on it's own and typically stuff like this has a cheat to get around it.